H&M Conscious Exclusive 2018 campaign. Photo by Mikael Jansson © H&M. Lilla Hyttnäs, a picturesque, timber cottage in the Swedish countryside where Swedish artists Karin and Carl Larsson lived and worked in the late 19th and early 20th century, stands worlds apart from the great Pacific garbage patch, a floating vortex of debris in the Pacific Ocean that exemplifies the ecological disaster wreaked by oceanic plastic pollution. And yet, fashion house H&M has managed to ingeniously intertwine the two in its Conscious Exclusive 2018 collection which commemorated the beautiful craftsmanship of the Larssons’ creative work while promoting sustainability, including plastic waste recycling. Part of H&M’s pioneering vision to lead the change towards a circular and renewable fashion industry, the annual Conscious Exclusive collection, now in its seventh year, showcases the brand’s sustainable fabric innovation by promoting the use of organic linen, organic cotton, organic silk, TENCEL™, which is a patented fabric from sustainable wood sources, and recycled polyester. Launched on April 19th, the 2018 collection, which comprises exquisitely crafted and feminine womenswear clothing, lingerie, shoes and accessories inspired by Karin and Carl Larsson’s exuberant palette of colours, patterns and motifs, features two new sustainable materials: recycled silver and ECONYL®, a nylon fibre completely regenerated from plastic waste, namely the type that perniciously finds its way to our oceans. Manufactured by Aquafil, a leading player in the global synthetic fibres industry with an ambitious path to sustainability, ECONYL® is made out of recycled fishnets and other nylon waste from oceans and landfills through an innovative chemical process that guarantees 100% virgin quality, and is the result of four years and millions of euros worth of research. The recycled nylon is turned into carpet and fabric yarn in a manufacturing cycle that can be endlessly repeated resulting in great environmental gains, not only by reducing product waste but also by reducing the use of fossil fuels and avoiding thousands of tons of CO2 emissions. H&M Conscious Exclusive 2018 brings together powerful femininity and sustainable fashion innovation with recycled silver and ECONYL®. By combining the latest in sustainable fabric innovation with designs inspired by the creative home of the Swedish artists Karin and Carl Larsson, the 2018 H&M Conscious Exclusive collection is a thoroughly modern expression of beautiful craft and powerful femininity. For the first time two new sustainable materials, recycled silver and ECONYL®, a 100% regenerated nylon fibre from fishnets and other nylon waste, are introduced to the collection. The ECONYL® Regeneration System is a unique process that allows Aquafil to produce 100% regenerated Nylon yarn using waste material instead of fossil raw material. The ECONYL® regenerated yarn is now use by the most important brands both in the carpet industry and the textile and fashion one. The H&M Conscious Exclusive 2018 collection features two seductive dresses made out of ECONYL®, a white sleeveless full-length dress with organic cotton embroidery, and a dark grey-blue lace long-sleeved mini-dress with voluminous arms and wide cuffs. The latter, worn by that rare specimen of ethereal beauty and sophistication that is supermodel Christy Turlington Burns, this year’s face of the H&M Conscious Exclusive campaign, dazzles in its self-assured femininity and dreamy daintiness. The campaign, which also includes models Aamito Lagum and Giedrė Dukauskaitė, was fittingly shot by fashion photographer Mikael Jansson at Lilla Hyttnäs, Karin and Carl Larsson’s unique home in Sundborn, Sweden, and the surrounding countryside which also served as the collection’s inspiration. 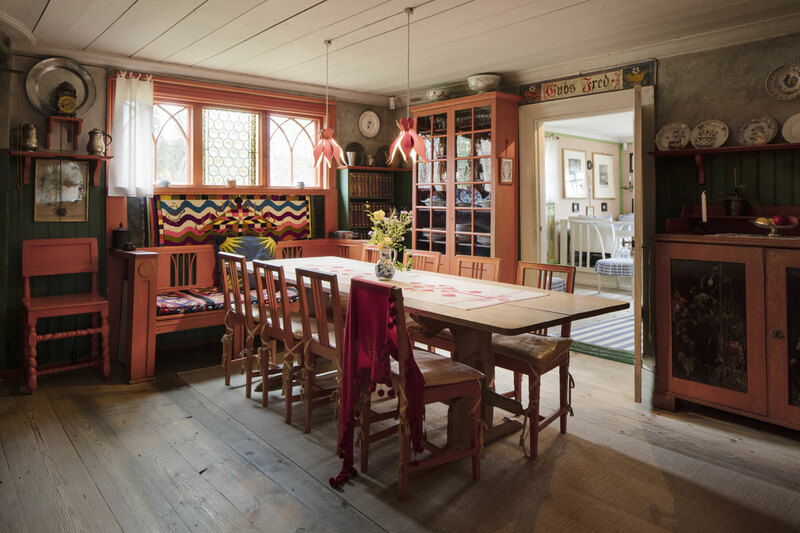 Key figures of the Arts and Crafts movement and two of Sweden’s most beloved artists, Karin and Carl turned their countryside cottage, inherited from Karin’s father, into an artistic statement. The house, accessible to the public through guided tours, is an illustrious reflection of the two artists’ free-spirited sensibility and audacious eclecticism embodied by Carl’s effusive decorative murals, colourful family portraits and hand-carved furniture, as well as by Karin’s hand-crafted textiles, rugs, table clothes and doorway curtains. Although Carl was the more famous artist of the two, it is Karin’s bold tapestries, ranging from abstract compositions in vibrant colours to stylised floral embroideries and black and white linen based on Japanese motifs, which now catch the visitor’s eye with their trendsetting originality. Inspired by the Larssons’ aesthetic partnership, which combined a revivalist streak of romanticism with a modern taste for the abstract, the H&M Conscious Exclusive 2018 collection juxtaposes romantic characteristics such as wide cuffs, high necklines and fabric-covered buttons with contemporary design features such as removable cuffs, raglan shoulders, drawstring details and subtle asymmetric hems, while Karin’s distinct approach to textile design has been translated into feminine yet bold head-to-toe prints, cross-stitch embroidery and interwoven metallic threads. 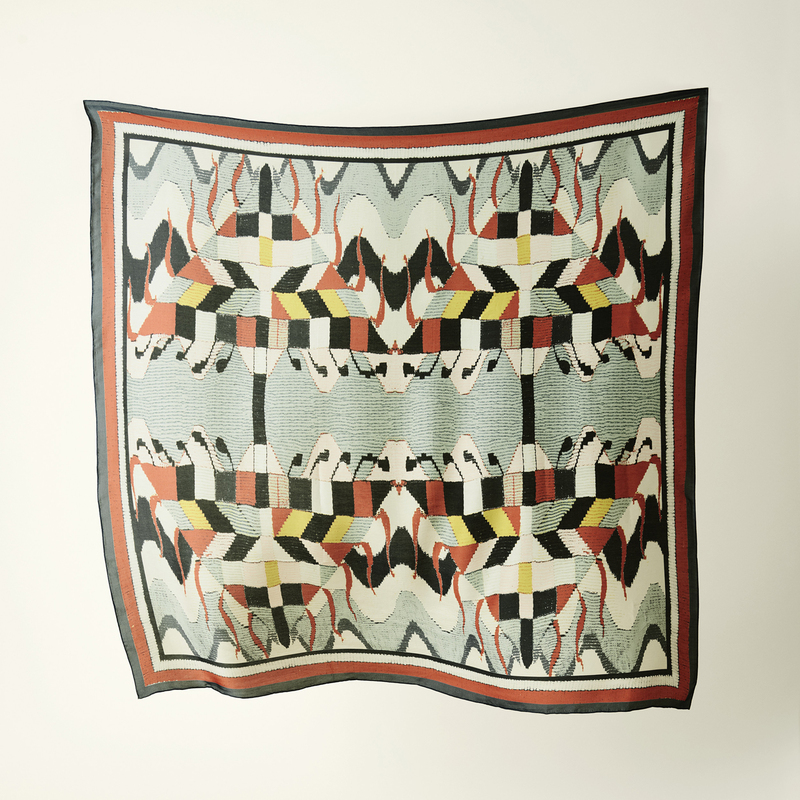 Scarf from the H&M Conscious Exclusive 2018 campaign. 76% tencel 24% silk. H&M Conscious Exclusive 2018 pays homage to the Arts and Crafts movement in Sweden and features the new sustainable materials recycled silver and ECONYL®, a 100% regenerated fibre from fishnets and other nylon waste. The H&M Conscious Exclusive 2018 collection's designs are inspired by the creative home of the Swedish artists Karin and Carl Larsson. Photo © The Larsson home. Highlights of the collection, apart from the two ECONYL® dresses, include a green floral full-length dress in a metallic jacquard fabric from recycled polyester, and a free-flowing full-length button-through dress featuring a Pegasus print, raglan shoulders and drawstring cuffs made from TENCEL™. Soft, supple and breathable, TENCEL™, the flagship brand of Austrian textile company Lenzing, is made from eucalyptus tree pulp and is considered as one of the most eco-friendly materials because it uses less land and considerably less water than cotton production and requires no toxic pesticides. Silky and light to the touch and luxurious in shine and flow, it makes for an ideal material for the two beautiful printed scarves that are also part of the collection. Just as impressive as turning plastic waste and tree pulp into ethereal dresses is the manufacturing concept behind the collection’s jewellery. Sourced from industrial scrap, such as old candle sticks, sterling silver flatware and coins, the silver junk has been recycled and turned into delicate tulip drop and split-hoop earrings, rings and bracelets by H&M’s talented designers. The sustainability of the Conscious Exclusive collections is part of H&M’s much wider effort to transition the fashion industry to a circular model where materials are maximized and waste is minimized while ensuring that everyone in its supply chain has access to a fair job as well as combating climate change. To this end, the Swedish clothing giant has ambitiously pledged (among other things) to only use 100% recycled or other sustainably-sourced materials by 2030 and to become climate positive across its entire value chain by 2040, effectively reducing more greenhouse gas emissions than what the value chain emits Judging by the company’s latest Sustainability Report. These goals are actually quite realistic as 35% of the group’s total material use is already 100% recycled or sustainably-sourced while 96% of the group’s electricity in 2017 comes from renewable energy sources. The key to making its vision a reality is of course innovation which the company wholeheartedly supports by identifying, investing in and promoting sustainable innovations, from new recycling technologies and new sustainable textile fibres, to digital systems that provide traceability information and new energy-saving solutions. Just as important is the strategy to encourage and empower sustainable actions throughout the company’s value chain, the fashion industry and the world at large, the latter also supported by the H&M Foundation, an independent non-profit entity funded by H&M’s founders that promotes global initiatives regarding education, water, equality and the planet aligned with the UN’s Sustainable Development Goals for 2030. Meanwhile, back on Lilla Hyttnäs, where nature and culture peacefully co-exist, the environmental perils that H&M is steadfastly working to prevent seem far, far away, as distant as the floating garbage patch that swirls in the middle of the Pacific. It is a rosy reflection of the eco-friendly, stylish future that H&M is striving for by continuously stretching the boundaries of sustainable fashion. H&M Conscious Exclusive 2018 campaign. Photo by Mikael Jansson © H&M. This corporate video gives some basics figures and information about what is Aquafil. Also the ECONYL® Regeneration System is mentioned. It is a unique regeneration process that allows the production of Nylon yarns from waste material. It was invented and developed by Aquafil. Aamito Lagum, Christy Turlington Burns and Giedrė Dukauskaitė.